Although there are 864 standard rooms at The Little Mermaid wing of Disney's Art of Animation Resort, the 1,120 themed family suites — Finding Nemo with 320 suites, Cars with 480 suites, and The Lion King with 320 suites — that comfortably sleep up to six, offers an exciting alternative for vacationing families. The four distinctly designed wings showcase Disney and Disney-Pixar films with original sketches, colorful icons and whimsical theming. Disney's Art of Animation Resort is expansive and not only features regular guest rooms and family suites, but also three pools, a food court and poolside concessions, playgrounds, and a family game room. Staying at the resort, guests can benefit from the best Disney perks, including transportation to Disney theme parks, water parks and Disney Springs and Extra Magic Hours. For those that like to stay connected, all Family Suites and Standard Guest Rooms include free WiFi! 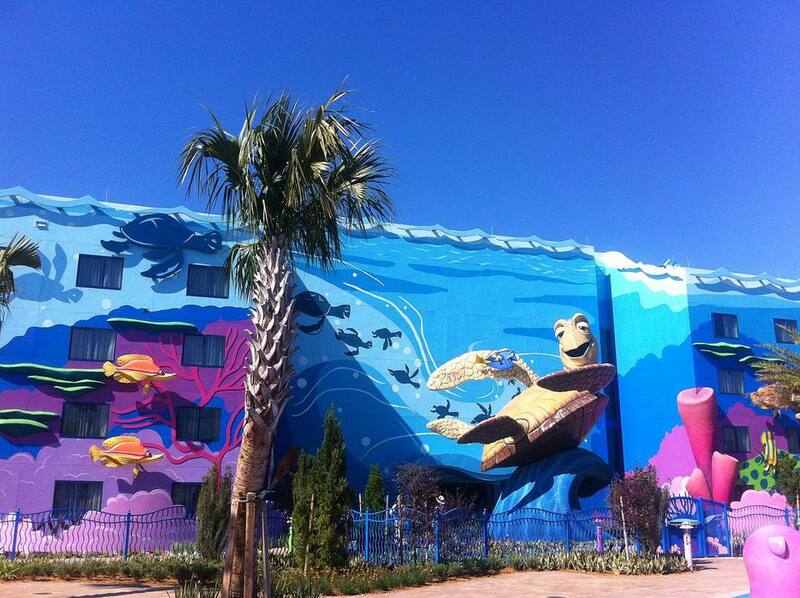 Step into Disney's Art of Animation Resort and you'll see a wall filled with larger-than-life sketches of popular animated Disney characters by some of Disney's most talented artists. Animation Hall is where guests of the resort will check-in and get their room assignment in one of four themed wings — Finding Nemo, Cars, The Lion King and The Little Mermaid. Also, inside Animation Hall you will find a whimsical chandelier composed of 77 animation storyboards and a colorful wall of lighted animation slides depicting action scenes from Disney and Disney-Pixar movies represented at the resort. Located off of Animation Hall is the Ink & Paint Shop, where you can pick up all those souvenirs before heading home; and, the Landscape of Flavors food court. Landscape of Flavors, Disney's Art of Animation Resort food court is open for breakfast, lunch, and dinner and features items such as fresh smoothies, hand-scooped gelato, and Mongolian barbecue. It is located in the Animation Hall building at the front of the resort. Tip: Save money when you stay in a Disney resort by purchasing a refillable mug. Crush from the Disney-Pixar animated film, Finding Nemo, is just one of the larger-than-life icons that adorn the courtyards at Disney's Art of Animation Resort. Crush looks like he's ready to make a splash at the "Big Blue" pool, the centerpiece of the resort and the largest swimming pool at Disney World Resort. Also see a giant Mr. Ray, whose wings span 27 feet! Other characters you'll find include Nemo's mates — Pearl, Tad, and Sheldon making a splash at the Schoolyard Sprayground, a wet play area with refreshing sprayers. The spacious 320 Finding Nemo Family Suites are decked out with jellyfish lampshades, a coral reef-themed headboard and cheerful color scheme. The Suites, which sleep a family of six (6) easily, are just steps away from the "Big Blue" pool with lots of action, day and night — hula hoop contests, ping pong, and nighttime movies. All the Family Suites at Disney's Art of Animation Resort feature kitchenettes with microwaves, mini-fridges and a sink. Family Suite units throughout the resort feature tables for dining and activities and then easily fold-up to make a Murphy bed at night. Sleeping arrangements for six include a queen bed in a separate bedroom (with a door), the double-size table bed and one double-size sleeper sofa. The bedrooms also include a dresser and a door for privacy. There are two (2) bathrooms per unit as well! Hey, Dude! Crush is calling kids of all ages that are sure to have a splish-splashing good time in the "Big Blue" pool at Disney's Art of Animation Resort. The zero-entry pool is the centerpiece of the resort and it's the largest resort swimming pool at Disney World Resort — measuring 11,859 square feet. As guests explore the colorful reef and East Australian Current with a giant-sized Mr. Ray, underwater speakers occasionally pipe in music and messages from film characters, so guests will feel like they're in scenes from the animated world. Tiny tots will enjoy frolicking with Squirt in the Righteous Reef, a dry children's play area nearby; and, making a splash at the Schoolyard Sprayground, a wet play area with sprayers. Righteous Reef is one of several play areas at Disney's Art of Animation Resort. Kids will enjoy frolicking with Squirt and playing hide-and-seek with each other (and parents too). Tip: This playground is located near the Big Blue pool, so parents should use caution and closely monitor their children. All of Disney's Value Resorts feature larger-than-life icons, but Disney's Art of Animation Resort provides nearly unlimited photo opportunities in four separate themed areas — Finding Nemo, Cars, The Lion King and The Little Mermaid. It's like taking a trip through Disney's most celebrated animated films and photos will surely bring back memories for years to come. Welcome to Radiator Springs. Cars fans will delight in Lightning McQueen, Mater, Flo and other characters from the popular Pixar film Cars leading the way down a paved road to 480 family suites and the 60's-style Cozy Cone Motel with Sheriff and Doc Hudson parked at the entryway. The Cars-themed family guest suites sleep up to six (6) and are high-octane fun — from the orange cones imprinted in the carpeting and adorning the light fixtures to the pull-out bed in the living room sofa that whimsically appears as the back seat of an old hot rod. Add the tool chest that is actually the dresser and the bathroom design inspired by a car wash, and you're sure to rev up some super-charged vacation adventures. Simba's journey is celebrated in The Lion King wing with landscape and theming that reflect both playful and poignant scenes from the Academy Award-winning Disney animated film "The Lion King." Scenes from the movie play out in every turn of the courtyard with King Mufasa towering atop Pride Rock while his evil brother Scar slinks in the shadows beyond the elephant graveyard. Then there's Pumbaa and Timon with Simba dancing across a long bridge in true carefree "Hakuna Matata" fashion. The Lion King-themed family suites are great for families with small children. They will love the bright colors and animal-theming and feel right at home with their favorite characters. Zazu takes center stage on the headboards, while Pumbaa and Timon decorate the shower curtain. Young ones can rest on a leaf-shaped chair or sleep alongside Simba, who is slumbering at the head of one of the beds. The suites comfortably sleep up to six (6). Ariel reins supreme over The Little Mermaid wing and at the Flippin' Fins pool at Disney's Art of Animation Resort. Standard guest rooms are colorful retreats themed to one of the most celebrated films of all time, "The Little Mermaid." The sea-inspired colors and aquatic motif plunge guests into the "under the sea" world of Ariel's secret grotto. The Little Mermaid wing was the final phase opened in September of 2012, with 864 standard guest rooms taking families on an under-the-sea adventure. The standard rooms sleep four (4) and feature either two double beds or one king, a television and small round table with two chairs. Additionally, the bathroom is divided from the bedroom with an under-the-sea-styled curtain with Ariel appearing as big as life on the shower curtain. Outside, guests will find the Flippin' Fins pool and pose in the courtyard alongside characters from the film — Ariel, Ursula, King Triton and Sebastian. Disney's Art of Animation Resort features a large arcade that all ages (even Mom and Dad) will enjoy, but will particularly make the teens in the family happy.